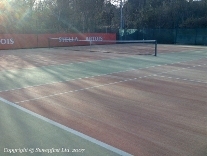 Synthetic turf tennis courts, artificial turf tennis courts, astroturf tennis courts or artificial grass tennis courts can be and continue to be successfully refurbished using the Sweepfast Hydrofast system. Once successfully completed the drainage will be restored and the hardening due to compaction virtually eradicated. 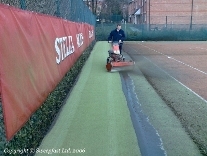 Firstly if the courts are badly contaminated with moss then they need to be treated with a suitable moss control. Secondly the deeper contamination and the contaminated sand infill are removed from the carpet. Sweepfast achieve this using the unique Hydrofast system mounted on an Avant 220 to displace the sand to the surface, once out of the carpet the Hydrofast System immediately lifts it off the surface and moves it out to be collected. Contaminated material is continually moved out of the path of the Hydrofast machine. 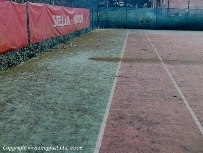 Finally after a treatment with a suitable moss control, new kiln dried silica sand infill material is applied and brushed into the refurbished tennis court to the correct depth. Because the Hydrofast System used high-pressure water at 4,000psi and 30 Litres per minute the effect on the sand infill and the debris trapped therein is dramatic, because water is very dense it has a high impact upon compacted dirt and sand easily displacing both to the surface. Water also has a second beneficial effect which is evident when you see the effect rain has on a contaminated surface; black sludge starts to appear. This is because the biological contamination which produces the black sludge, is less dense than water and easily floats to the top once it is broken away from the sand it is trapped in. Check out our refurbishment results here.